The main point is that the most successful companies are the ones that master the art of delegation. Large companies delegate tasks to smaller companies, or even other large companies with expertise in certain areas (accounting, legal, research, testing, etc.). Smaller companies delegate tasks to independent and small businesses. Small business delegate tasks to independent contractors… The problem is that delegation is often confused with “dumping a task on someone else’s desk.” And yes, that would be a case of very poorly executed delegation. Wise delegation is not about managers delegating tasks to those below them. That would just add one more step to your production process and delay your completion time. Wise delegation is about freeing up your time so that you can focus on other projects that will generate additional income for your business. 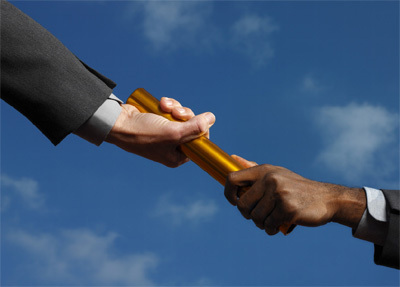 It is also about trust; trusting another person to finish what you have started so you can focus on new ventures. There’s no good delegation without empowerment. Every company (even non-profits) is in the business of making money. I am in the business of making money. The moment I can find someone (person or vendor) that will free up my time so that I can stay focused on my business or create new businesses, I do not hesitate to hire them and delegate. In other words, my goal is always to work ON the business and not so much IN the business. New entrepreneurs often set up their initial revenue goal so that they are able to replace their annual salary at their past job with their new business income. That will work fine when your business is really small and as long as you have what it takes to run it successfully. But the difference between earning 5 figures and 6 figures annually depends on how well organized you are and how many clients or projects you can handle. However, it is when you want to jump from 6 figures to 7 figures in annual revenues, that you will realize that the only way you can do that is by creating a solid team around you, set up proper systems and procedures, and delegating most of your tasks to your team leaders. Some “solo-preneurs” are afraid to make that jump and remain stuck within their comfort zone. Those who have the proper mindset and a strong desire to grow, will see building a solid team as a natural growth stage. If you can do that and are not afraid to delegate, your income will grow. So go ahead, fill those empty chairs with qualified people, build a solid team, empower them to make their own decisions, let your business grow and come back and share with all of us how you did it. Yes, delegation is an art, and it is not easy to master, but those who learn it, will always be more successful than those who don’t. Until next time, this is Manuel Gil del Real.